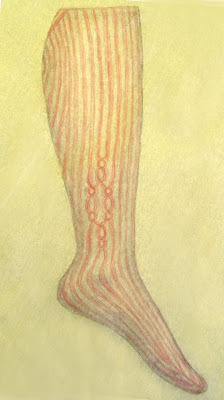 I am thrilled and honored to have my Calliope brioche socks published by Twist Collective. Even though the pattern bears my name, it’s amazing how of a collaborative work it really is, what with yarn choice, editing, layout, photography, and modelling. And a rocking sample knitter (verdigrisknits on Ravelry) who made the red and purple socks, which totally sell the pattern. I work with multiple colors whenever I get the chance, but go to great lengths to avoid working more than one color at a time. Mosaic, double knitting, duplicate stitch – I love them all, but brioche is my favorite. Better yet, even after designing several brioche patterns, I’m still not entirely sure how it works. I’m endlessly entertained by the mystery of how on earth I’m actually producing that fabric. With designing, I have started to pierce the veil in places--try enough ways to make the perfect increase, decrease or cable, and something’s bound to sink in. But much remains opaque (such as how to drop down a column, fix a mistake and work back up; grmble grmble ratzen fratzen). Yet another thing I love about brioche is that it’s an emerging style, so there’s plenty of room for new unventors to make contributions to the literature. Who knows, maybe it’s even possible to invent? There’s no way of knowing, of course. One can only say, well, I was unable to find instructions for this on the Internet. So, I think I may have un/invented the stockinette short row brioche heel. Doesn’t sound like a big deal, really. In fact, when I made my proposal to Twist, I blithely sketched the stripes continuing uninterrupted down the heel, assuming I would easily find instructions on how to achieve this effect. Nope. No how. No where. I set out on a quest to conquer the short row. The main thing I can tell you about the process is that there are many, many wrong ways to do stockinette brioche short rows. Finally I decided there might be only one right way to do them. This was an astonishing notion, because that is just not the way things work in knitting. In fact, I rather hope that stating my conclusion publicly will prompt someone to step forward and disprove it. As a side note, I hope I’m not the only designer who writes down in excruciating detail exactly what she did, follows those instructions to the letter to confirm them . . . and arrives at a different result. This does not facilitate the xxvention process. Fortunately, the Kollage Sock-a-Licious was more than up to the task of repeated frogging and re-knitting. Oh, and the name. I could write something high-flown about how the socks were inspired by the rowdy music surrounding striped big top circus tents and curlicued carousels. 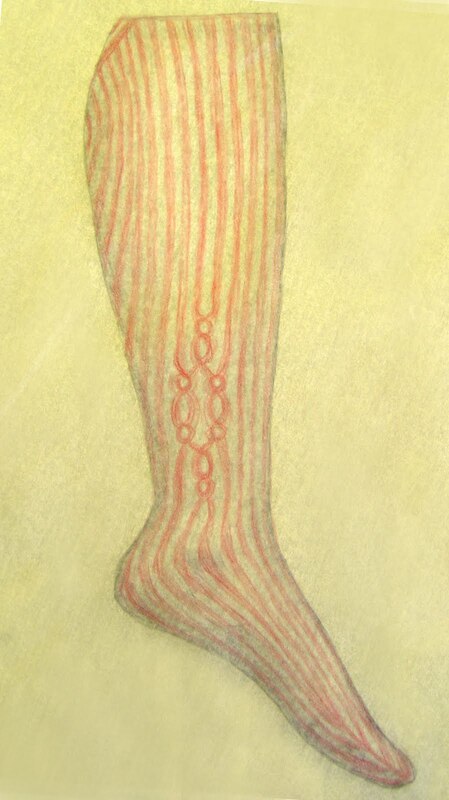 * But in truth, I was inspired by men’s stockings of the Regency era. Probably one didn’t find stockings with both stripes and clocks back then, and a dandy certainly would not have worn wool stockings. But one of the great things about inspiration is that it can accommodate a fine and appropriate disregard for the facts. *By the way, the Wikipedia article on calliopes is an excellent read (although in my neck of the woods, we do NOT pronounce it "kal-ee-oap"). Awesome post. I love the socks and your desciption of how they came to be.